Making sure their children are ready for the start of another school-year is a priority for many of our members. While you are preparing for your children’s school year, you may also want to take a moment to assess your current insurance needs. Our needs assessment can help you determine the level of term life insurance coverage you may want to consider so that your family will be better protected in the event of the unexpected. Need more information? Call me today at 800-621-8981 ext. 6420. These are group insurance plans, meaning coverage is issued to an ABE Member under a certificate of Insurance; it is not provided under an individual policy, nor is it employer/employee insurance. The plans are underwritten by New York Life Insurance Company under Policy Form GMR. 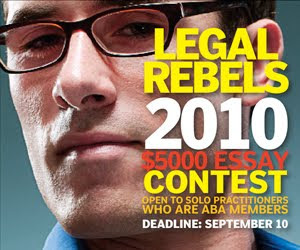 Each year the ABA Legal Rebels hold an essay contest awarding the winner $5,000. This year, in light of the ABA’s new focus on solo and small firm attorneys, the essay is open exclusively to solo practitioners. In 600 words, or 5 minutes of video or less, solos are asked to answer: What innovation will be most valuable to you in your future practice as a solo practitioner? Many new and emerging innovations could be utilized by all lawyers, including solos, especially in the technology and law practice management arena. One important law practice management tool that could be of value to solos, is the insurance plan known as Professional Overhead Expense insurance. Just like life and disability insurance protect you and your family’s personal finances in the face of the unexpected, Professional Overhead Expense insurance protects your practice if you become totally disabled and are unable to work. It can help keep your doors open for up to a year, keeping your staff and monthly debt obligations paid, and your practice afloat...I'd say that’s valuable! While many solos will be entering the LR essay contest with ideas such as new pricing structures or marketing tactics that help grow their practice, we hope you’ll consider protecting your practice with insurance, one of the foundations of financial security. This is a group insurance plan, meaning coverage is issued to an ABA Member under a certificate of Insurance; it is not provided under an individual policy, nor is it employer/employee insurance. Underwritten by New York Life Insurance Company under Policy Form GMR. We’ve all heard that old adage and it is often true. When you begin, or review your current, financial planning, think about life insurance as the foundation for your financial plan. Not only can term life insurance be a cost-effective way to help protect your family’s financial security, it helps provide you and them with peace of mind knowing they will be better taken care of in the event of the unexpected. Call me at 1-800-621-8981 ext. 6420 to discuss your term life insurance needs and help build the cornerstone of your financial plan. Help Us Find Abe at the Annual Meeting! Are you attending the ABA Annual Meeting this week? If so, visit the ABE at booth 417 and help us find Abe!